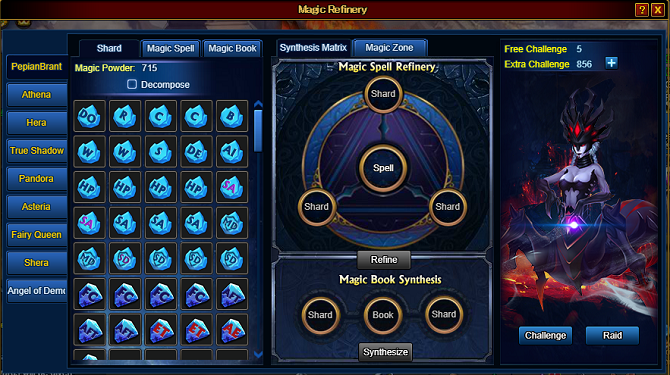 There are five main factors in Magic Refinery: Magic Shard, Magic Spell, Magic Book, Magic Powder and Magic Zone. Magic Shard can be obtained through the trial at the right side of the interface. Players will have 5 free challenge chances each day, and the free chances will be reset at 0:00 each day. Players can also purchase additional challenge chances with gold. There will be monsters of different attributes appear in each challenge, the monsters have powerful buff and can’t be defeated. Don’t worry about that, the shards can be obtained as long as players participate in the trail. Players of VIP 6 or above can use the Raid function. 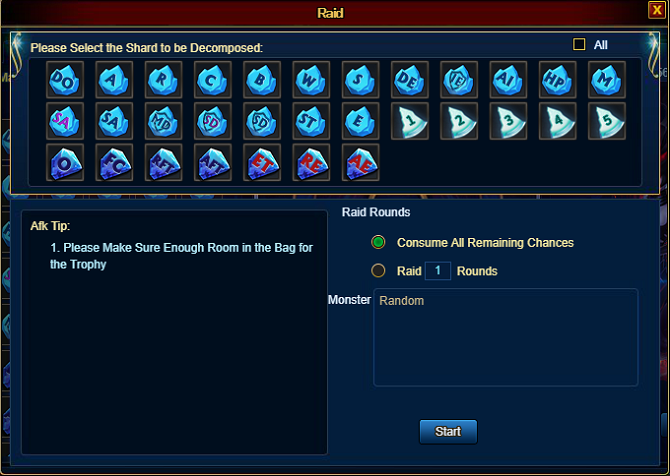 Players can select the unneeded Magic Shard in Raid interface and decompose Magic Shards to save the space of Magic Refinery Pack. There are three types of Magic Shard including Target, Attribute and Number. Each Shard can be decomposed into 5 Magic Powder. Magic Spell will be triggered as passive skill during the battle, different Magic Spells have different trigger conditions. For example, there is a Magic Spell which can increase friendly character at 1 round dodge+1000, last for 2 rounds. 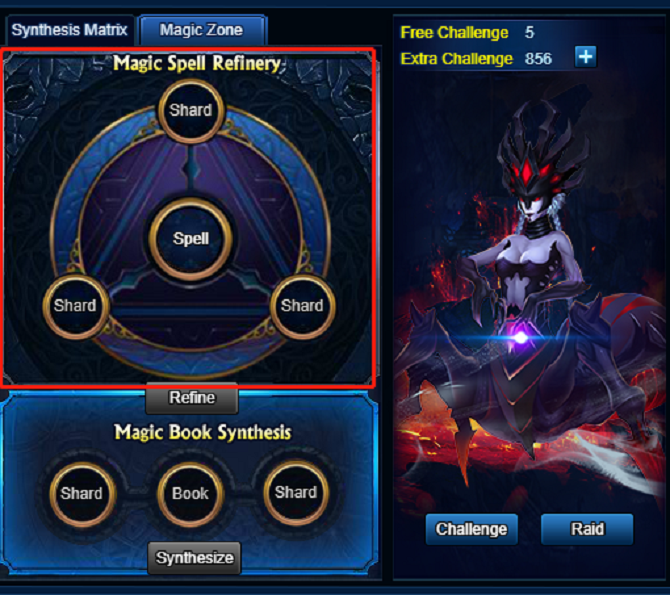 Put three Magic Shards of different types into Synthesis Matrix and spend 2000 Gold to refine Magic Spell. Different Shards can be used to refine different Magic Spells. Players can use their imagination and try different combinations according to their own requirements. Each Magic Spell can be decomposed into 100 Magic Powder. “When oneself is stunned for once, all enemies stun resistance -2500, last for 3 rounds” This Magic Spell is made up with three elements including “all enemies, stun and 3”, therefore, we can select stun resistance shard, number 3 shard and all enemies shard to refine this Magic Spell, there will be a large possibility to get this kind of spell by doing this. Players can choose different attributes for their characters in Magic Book. Higher the level of Magic Book, more terms of the attribute. Magic Shards of Attribute and Number type can be synthesized into Magic Books. 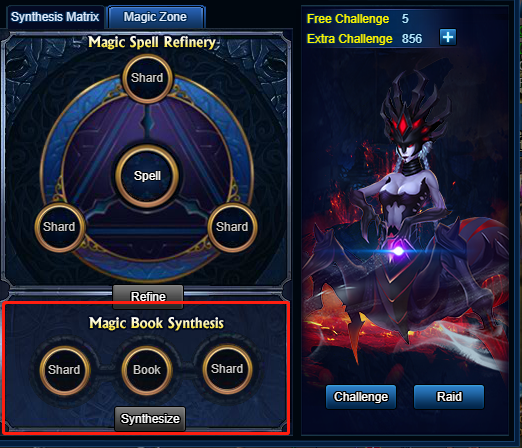 Different Shard Combination can produce Magic Books of different Magic Books. Number Shard with bigger number will produce Magic Books with better attributes. Tips: Magic Book Synthesis may fail sometimes. Magic Book can be upgraded by consuming Magic Powder, the upgrade cost will increase according to the level of Magic Book. However, the attributes will also be more powerful. At present the maximum level of Magic Book is Lv. 100. Magic Powder can be obtained by decomposing Magic Shards, Magic Spells and Magic Books. Magic Powder can be used to unlock Magic Shard slot, Magic Spell slot, Magic Book Slot, Magic Zone and upgrade Magic Book. Magic Zone is the space bag used to equip Magic Spell and Magic Book, and each character has his or her own Magic Zone. Magic Spell and Magic Book need to be equipped into the Magic Zone of the character before it comes into effect. Each character can equip 1 Magic Spell and 5 Magic Books. 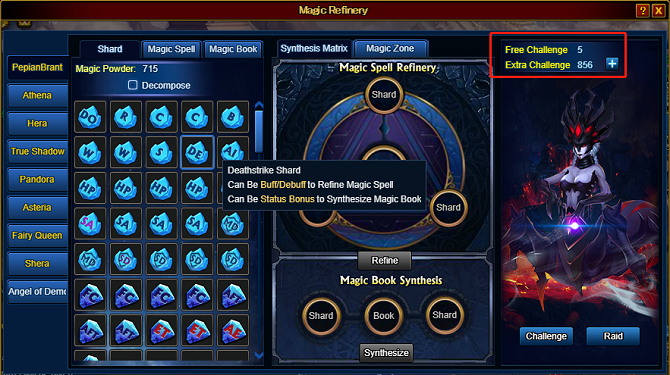 Players can unlock 1 Magic Spell slot by consuming 500 Magic Powder, and 1 Magic Book slotby consuming 100 Magic Powder. In Magic Refinery bag, Players can tick Decompose button and select all the Magic Shard, Spell and book to decompose them. Anti-Invisible: Enable you to have a chance to attack enemies’ Invisible targets. No need to be afraid of endless invisible effect after unlocking Magic Refinery Feature! !